To all the present and former little girls who ever saw The Little Mermaid—dreams do come true. Thanks to classes hosted by AquaMermaid, the Phoenix branch of which is located at The Phoenician resort in Scottsdale, adults and children alike are able to live out their dreams of being a mermaid. The mermaid class was held in the Oasis pool, which took me some time to find since I hadn't been to the resort before and only saw one sign for the classes. I met Jenny where a bunch of mermaid suits were hanging at the end of a walkway between two pools. We stood there for several minutes after the hour, wondering if any kind of instructor was going to show and realizing that we would be the only two taking that day's adult class. Two women appeared a few minutes later and helped us get checked in and put on our mermaid tails. The tails were made of one plastic fin that you put both feet into, and a fabric slip that goes over the fin and up your legs—morphing you into a mermaid. The instructor, Desiree, spent about 45 minutes teaching us exercises and "natural mermaid moves". I'll admit, being a mermaid was a lot more work than I thought. You have to use a whole different set of ab and leg muscles and you have to put more power into those muscles. But once you get the hang of swimming like a mermaid, you really fly through the water. We spend the last 20 minutes or so doing a mermaid photoshoot and performing tricks in the water. Desiree showed me how to do back flips, hand stands, tail splashes, and graceful (hers more so than mine) mermaid turn-a-rounds. Overall, I was pretty impressed with the class and the exercises Desiree taught us. I wasn't expecting to learn so many mermaid moves and techniques. 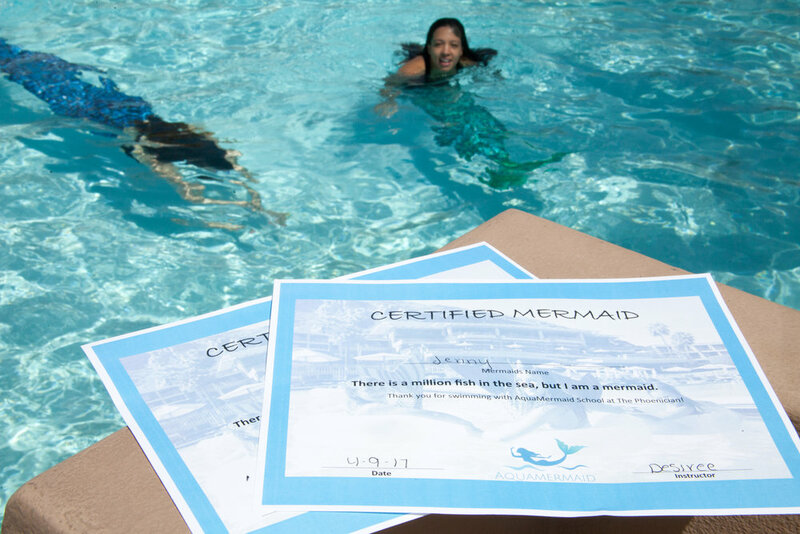 Desiree even gave us each a certificate at the end of the class, as proof that we made a childhood dream come true and have what it takes to be a mermaid.